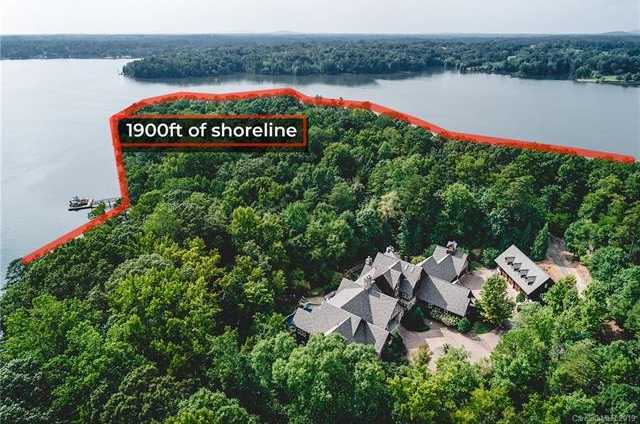 Magnificently resting on a secluded 11-acre wooded point lot within the Sanctuary, an exclusive luxury lake community on Lake Wylie. This extraordinary 6-bedroom custom home has over 15,000 sq ft of private luxury living! Gate w/ lighted entrance, circular driveway & total of 8-car garage. Spacious entry, beautifully crafted staircase, remarkable living room w/ wall of arched windows under cathedral ceilings & airy formal dining room. Extraordinary kitchen features 3 ovens, warming drawer, microwave, two dishwashers, one double/one triple sink. Grand great room has dramatic stone fireplace & wood beamed cathedral ceilings. Radiant heat floors in master bath, 2 wet bars, 3 fireplaces, 2nd floor 2018;mini2019; master, media room, exercise & craft room w/ closets & baths, 4-floor elevator, 3-screened-in porches, pool w/ 2 waterfalls, boat slip w/ 2 electronic lifts, Icynene insulation, 5-tankless water heaters & a 1,500 sq ft 2/bed, 2/bath guest house w/ full kitchen/laundry! See attached list!